Year of creation – 1841. Materials – oil on canvas, size – 64.77 by 53.34 cm. Stored in Harvard University Art Museum, Cambridge, USA. 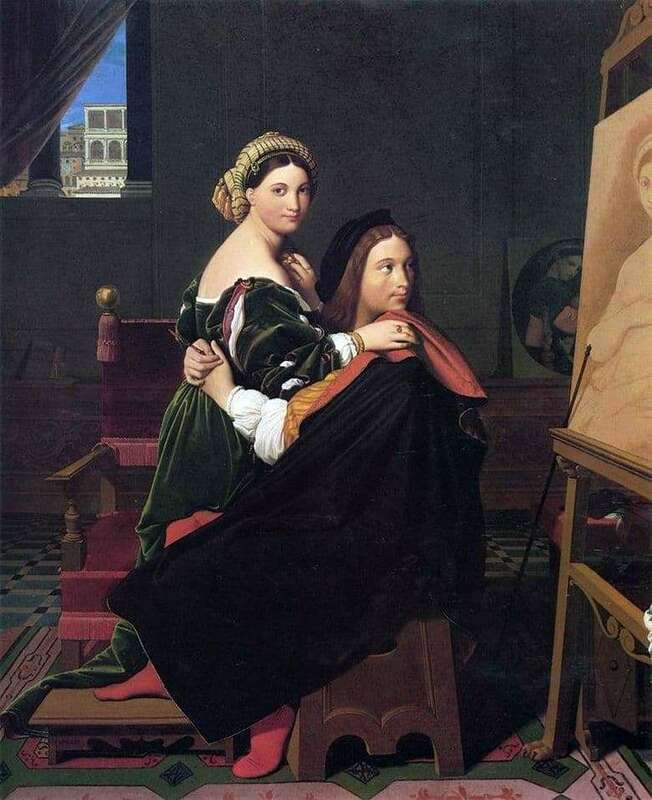 The canvas was written in the period of life of Ingres in Rome, when his style was already fully formed. The double portrait depicts another famous painter from the Renaissance, Rafael Santi and his beloved Margherita Luti, who was nicknamed Fornarin because of her father, by profession of baker (fornaio in Italian). There are two versions of the relationship of the couple: it was great and pure love; the girl differed infidelity, and only the artist was in her selflessly in love until his death. The theme of “artist-model” was very popular in the XIX century. Female image that can be traced in facial features, hair and headdress; the characteristic face of the man was borrowed from the works of Raphael “Portrait of a Young Woman, or Fornarin” (1518-1519) – in an unfinished form is shown here on an easel – and “Self-portrait” (1506), respectively. Jean Auguste used a rather interesting trick, because in fact the viewer here sees Margherita three times – “live”, on the outline and the already completed picture in the background. However, it is still not reliably known whether this lady actually existed. The lovers are in a richly decorated art workshop, a mosaic floor, a patterned carpet, probably marble walls, a velvet chair are traced in detail, behind a large window with columns you can see a piece of the Italian city. Also, special attention is paid to clothing – folds of a dark green softly shining dress and a black and red cape. A genius with a brush in his hand as if compares the drawing with the original in her arms, and she only smiles condescendingly, realizing her power over him. It is worth noting the composition, realism and the original approach of the creator to the almost legendary history, perfectly balanced on the diagonals with light and dark spots.